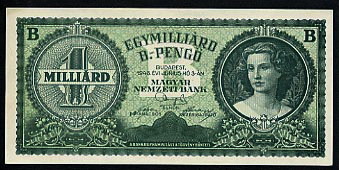 The world’s highest denomination note is Hungary 100 Million B-Pengo (American 100 Quintillion Pengo)*, issued in 1946. That’s 100,000,000,000,000,000,000 Pengo. It was worth about U.S. $0.20 in 1946. Hungary also printed a 1 Milliard B-Pengo (Amerian 1 Sextillion Pengo)*, 1,000,000,000,000,000,000,000 Pengo, note in 1946. 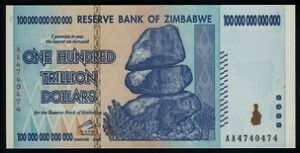 Overtaken by inflation, it was never in circulation. Romania 1 Million (1,000,000) Lei, issued in 2003, is the world’s highest denomination polymer plastic banknote. It’s no longer legal tender. 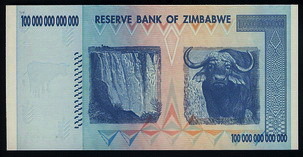 Four zeros were dropped in the 2005 currency reform. 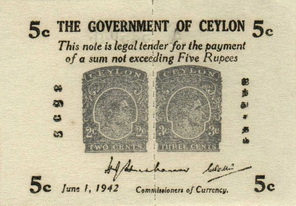 The lowest fractional note is Fiji 1 penny, issued in 1942. The old penny, being 1/240 of a pound, is a lower denomination than other fractional notes based on 1/100th of a basic monetary unit. The notes with no denomination – Tatarstan issued a series of currency checks without any denomination printed. China is the first country to use paper money. 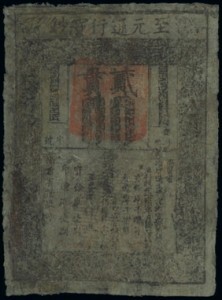 Ancient paper money can be traced back to the Pai-Lu P’i-pi (white deer-skin money) of Han Dynasty (120 BC) and the Fei-Chien (flying money) of Tang Dynasty (618-907 AD). However, paper money did not have widespread circulation until the Southern Sung Dynasty (1127-1279 AD), and none has survived. The earliest surviving notes are a few from the Chin Dynasty (1115-1234) and Yuan Dynasty (1280-1368 AD), and they can be found in some museums. 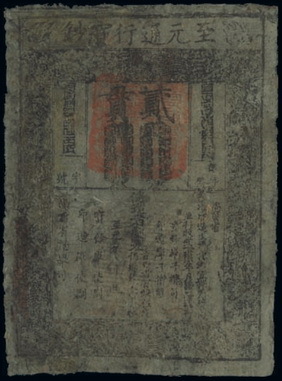 This Yuan Dynasty 2 Kuan (1335-1340) note predates the more well known Ming Dynasty 1 Kuan note by several decades and is one of the oldest surviving banknotes in the world. To commemorate the Centennial of Independence from more than 300 years of Spanish colonial rule in 1998, the government of the Philippines wanted to do something very special. It issued the world’s largest banknote 355.6 mm by 215.9 mm (14″ x 8 1/2″), beating the previous record: China Ming Dynasty 1 Kuan220 mm x 335mm (8 3/4″ x 13 1/4″). 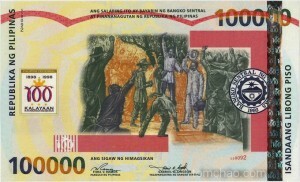 The 100,000 Piso note, measuring 355.6 mm by 215.9 mm (14 x 8 1/2 inches), is accredited by the Guinness World Records as the world’s largest legal tender note in terms of size. 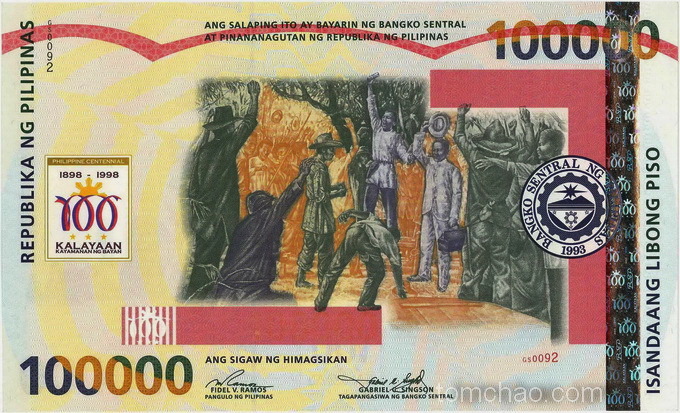 The front depicts the “Cry of Pugadlawin”, when about 1,000 Filipino patriots led by Andres Bonifacio gathered in Pugadlawin, on August 23, 1896. They tore up their Spanish-issued residence certificates and yelled “Long live the Philippines”, signalling the start of a revolt against Spain. The back features General Emilio Aguinaldo displaying the Philippine flag to the crowd below and proclaiming independence from Spain from the balcony of his house in Kawit, Cavite on June 12, 1898. Only 1,000 of these notes were issued. Originally offered to collectors at a pre-issue price of 180,000 Piso (US$4175). In times of war, coins are often in short supply. Gold and silver coins are hoarded for their intrinsic values. Other metals are appropriated for war efforts. 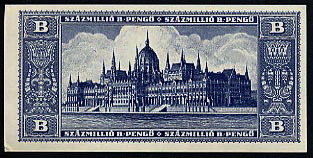 Many governments resort to printing small denomination banknotes as temporary substitutes. 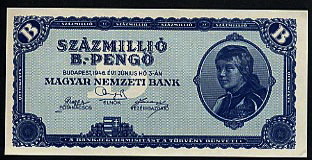 The following are some of the countries which had issued postage size banknotes: Ivory Coast, Macao, Monaco, Morocco, New Caledonia, Romania, Russia, Spain and United States. Guinness World Records 2008 edition lists Romania 10 Bani 1917 note, measuring 34 mm x 45 mm (1 5/16″ x 1 3/4″), as the world’s smallest banknote. Actually, Morocco 50 Centimes 1944 emergency issue, measuring only 42mm x 31mm (1 11/16″ x 1 1/4″), is smaller. The note with the most zeros is Zimbabwe 100 trillion (100,000,000,000,000) dollars 2008 (issued 2009). 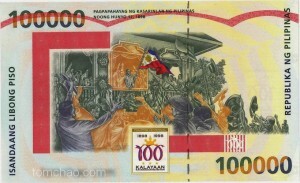 The note has 14 zeros printed on both the front and the back. This note, consisting of a 2 cents stamp on the left and a 3 cents stamp on the right, roulettes down the center for ease of separation. It is probably the only currency note which could be torn in two and the two parts were still legal tender at different denominations. Queen Elizabeth II is the second longest reigning head of state after King Rama IX of Thailand. She has been Queen since 1952. Her pictures appear on banknotes of 34 countries. The United States government did not print banknotes until 1861. However, almost immediately after adoption of the Constitution in 1789, Congress chartered the first Bank of the United States and authorized it to issue paper bank notes to eliminate confusion and simplify trade. The bank thus served as the quasi central bank of the United States. This $50 note was issued in 1801, exactly midway in the bank’s twenty-year charter. A world record of $3,290,000 was paid for a $1,000 1890 “Grand Watermelon” note in January 2014. It’s the world’s most expensive banknote. Central African States – Cameroon, Central African Republic, Chad, Congo, Equatorial Guinea and Gabon. East Caribbean States – Antigua, Anguilla, Dominica, Grenada, Montserrat, St. Kitts, St. Lucia and St. Vincent. French Pacific Territories – French Polynesia, New Caledonia, and Wallis & Futuna Islands. West African States – Benin, Burkina Faso, Guinea-Bissau, Ivory Coast, Mali, Niger, Senegal and Togo. European Monetary Union – Austria, Belgium, Cyprus, Estonia, Finland, France, Germany, Greece, Ireland, Italy, Latvia, Luxembourg, Malta, Netherlands, Portugal, Slovakia, Slovenia and Spain. Many other countries also use Euro or pegged their currencies to Euro.